Usually when it comes to elections and we refer to someone talking with their wallet, it is via campaign donations. Today, via an email subscription and my uncontrollable urge to click links when I see them, (yes, it is a sickness) I found a little political entertainment. The CafePress which sells a variety of items from T-shirts to cups, stickers to stationary, to name a few among a whole host of unique gifts, offers yet another fun way to gauge the spending public's election sentiment. CafePress runs an "Election Meter", tracking the sales of their merchandise and seeing a correlation of their sales matching nicely with national polls. When a Republican candidate is polling well, sales for merchandise with that candidates name rises as well. For example, Newt Gingrich recently started surging in the polls and coincidentally, the CarePress Meter tool showed "The Rise of Newt" in sales. As the GOP field heads into primary season, those numbers fluctuate and most likely will continue to do so until one candidate is nominated to go up against Obama in 2012. According to the clothier, the “Meter” successfully predicted President Obama’s victory in 2008. 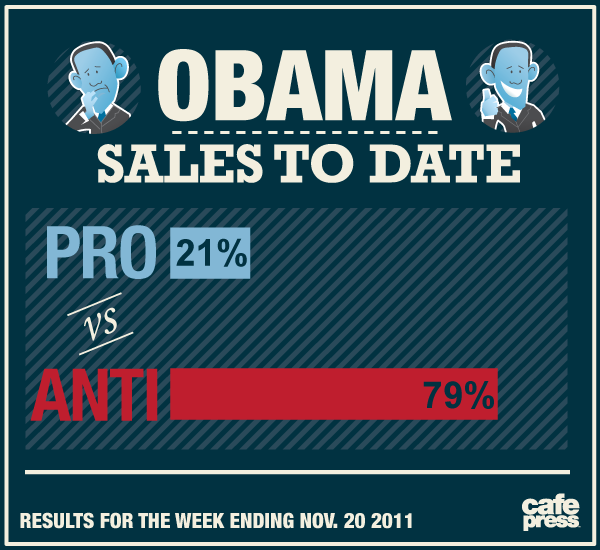 This week’s data represents a stark contrast to Obama’s sales during the 2008 election cycle. 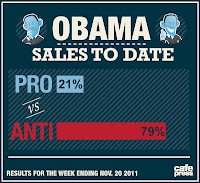 According to the results for the week ending: Nov 20, 2011, Anti-Obama merchandise outsold pro-Obama merchandise by almost four-to-one at 79 percent to 21 percent. Marc Cowlin, Director of Marketing at CafePress, stated via a November 8, 2011 press release "As was the case in 2008, merchandise sales can be extremely insightful. On CafePress, which features user-designed products, creating designs and purchasing products is synonymous with political expression. That's what makes our site such an interesting poll, and we're often referred to as a Cultural Barometer(R). Our users are among some of the most politically-engaged and use CafePress to voice how they feel about a candidate or a campaign." So, if you are politically engaged and you want to become part of that Cultural Barometer(R) and you believe, like I do, that "Anyone but Obama" is better than Obama in 2012, head on over and get yourself some Anti-Obama gear!! !